Treasure-hunting team Sam and Remi Fargo's search for a Romanov fortune brings them into perilous contact with an ambitious neo-Nazi clan, in the thrilling adventure from the #1 New York Times-bestselling author. 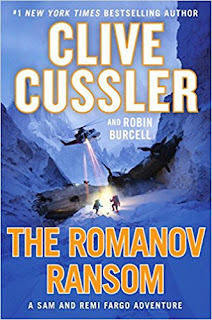 Nobody does popcorn thrillers and over-the-top treasure hunts quite like Clive Cussler, and the Fargos are probably my favorite characters next to Dirk Pitt. It's not quite a summer release, but still one to enjoy while kicking back outside for an afternoon. I didn't know Clive Cussler was still churning the books out. He must've released a good few by now. The cover is good, I like that kind of snow scene.